Benidorm, Spain is a fun place, perfect for a family holiday, from the young of age to the young at heart, Benidorm has something for everyone. 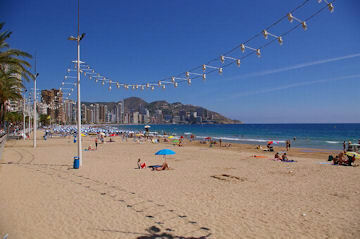 Benidorm is blessed with some excellent beaches. The very popular and long 'Levante Beach' is one of the best beaches in Europe with water sports during the day, lots of cafes and bars and plenty of night life for all ages. 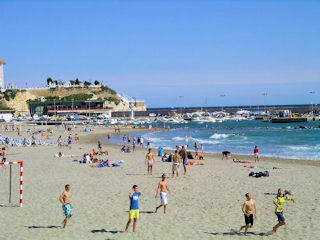 The quieter 'Poniente Beach' is just as big but more peaceful, perfect for relaxing in the sun. There's also the smaller beach of 'La Cala' just around the corner. Benidorm is wonderful for shopping too with lots of very cheap gift and cloth shops to the more exclusive jewellery and fashionable ornament shops. Benidorm also has an indoor market open daily and a very large outdoor market on Wednesday and Sunday. A wide variety of bars and restaurants for varied tastes and budgets, you can find the traditional Spanish paella and tapas bars with local beers to the familiar English & Irish pub-grub, including the Ibrox bar for the Scottish. Within Benidorm there are many hidden gems for the sightseers. A must see is the headland that divides the two beaches called 'Plaça del Castell'. This beautiful area is part of the original 'Old Town' with Benidorm church perched high on the raised cliff headland and the beautifully maintained tiled court area providing spectacular views of both beaches and the Mediterranean sea. Also a good view point for Benidorm Island, a wildlife reserve, with just one hotel restaurant-bar, accessible only by boat, there are many trips out to and around the island, to see the variety of land and sea life on offer at the reserve. You will find a wide variety of entertainment within and around Benidorm, from Karaoke bars and numerous night clubs to the more exclusive 'Benidorm Palace' with their evening meal and cabaret. 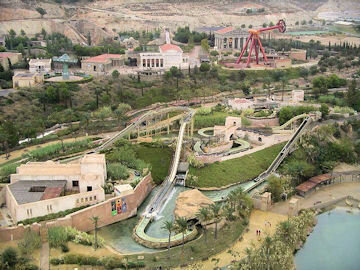 There's lots of family holiday amusements, arcades, water sports, water parks, animal safari parks, 'Terra Mitica' Theme Park with roller-coasters and thrill rides, go-karting and much, much more. If Golf's your thing, then Benidorm has a number of championship golf courses, putting greens and even crazy golf for the kids and family. The question is how will you fit it all into just one holiday?